We have an incredible staff at our Murray Ryan Visitor Center ready to welcome you! Stop in for free maps, guides, and additional assistance. Not to mention that our visitor center is right in the heart of Historic Downtown. Start your adventure with us. 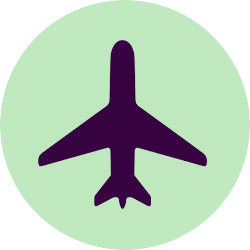 The closest commercial airport is Grant County Airport and is served by Boutique Air. Four flights a day (weekdays) each way. Fewer flights on the weekend. It is a 30-minute drive to Silver City. El Paso International Airport is just under three hours away. At present there is no direct transportation to Silver City, and you would need to rent a car. Tucson International Airport is three hours away. 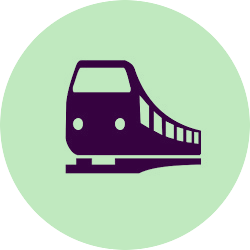 At present there is no direct transportation to Silver City, and you would need to rent a car. Albuquerque International Sunport is the furthest away of the three regional airports (4 hour drive); however it is possible catch a connecting flight from here to Grant County Airport. Private airplanes may land at either Grant County Airport or at the Whiskey Creek Airport just east of Silver City. Ground transportation is available through Corre Caminos bus/shuttle service (575-388-3180 or toll-free at 866-934-3866). 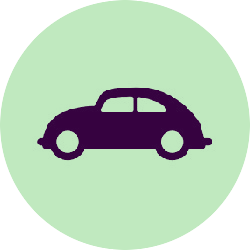 Enterprise Car Rental has an office in Silver City and can pick up and drop off renters at the Grant County Airport (575-534-0000 is their local number, or you can make a reservation via their nationwide toll-free number 800-736-8222). Amtrak has service to Deming (just under an hour south of Silver City) or to Lordsburg (45 minutes south). At present there is no public transportation to Silver City from Lordsburg. There is limited transportation from Deming via Corre Caminos (two trips per day): 575-388-3180 or toll-free at 866-934-3866. 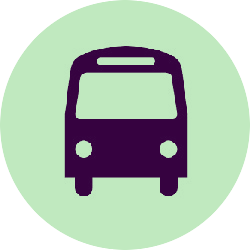 Greyhound has bus service to Deming and Lordsburg. The main roads into Silver City are US Highway 180 (which runs from Alpine, Arizona to Deming) and Highway 90 (which runs from Lordsburg northeast to Silver City). The nearest Interstate highway is I-10. Take I-10 east to exit 20-B in Lordsburg and Hwy 90 north to Silver City. Take I-10 west to exit 82-A in Deming and Hwy 180 north to Silver City. 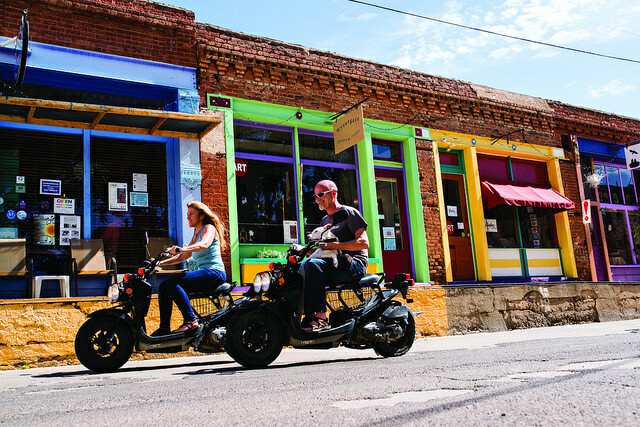 Most visitors will find that having a car really helps, but if you are staying close to Silver City’s downtown, there is a lot you can do on foot. There are also bicycle rentals available as well as public transportation. There are plenty of adventures in store for you! 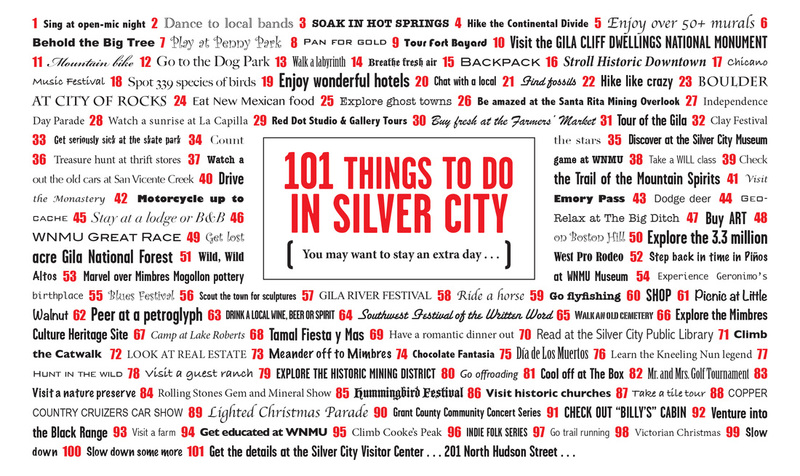 Silver City is for the explorer and wanderer, the outdoor enthusiast and the antique treasure hunter, the foodie and the restful vacationer... Check out our annual and daily events!